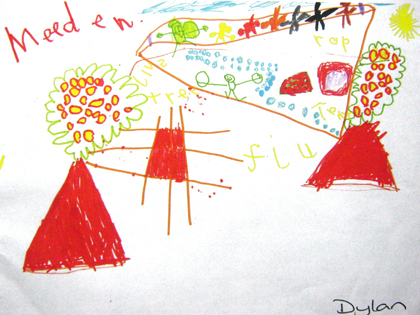 D: It’s a picture of me – that’s me [in green, just above centre]. We had to write words by everything. They’re the trees [left and right]; that’s a fire [centre]; that’s all the clues so that people can find the Easter eggs [blue dots]. They’re Superheroes [top] that I made out of my modelling box [right of ‘me’]. And that says ‘rope’ because we had to make a house with some rope.